WILLS POINT, TX – Gospel for Asia (GFA) – Discussing the global water crisis. It amazes me when I ponder some of the things that we take for granted. Especially when they are things upon which our very lives depend. Things like water.I don’t think it would be hyperbole to say that the vast majority of Americans are unaware that there is a global water crisis and that billions of people are affected by it every single day. 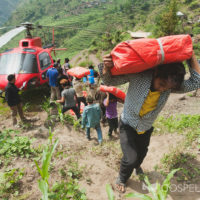 Gospel for Asia recently released a special report titled “Dying of Thirst: the Global Water Crisis,” which highlights many of the worldwide issues people are facing today concerning the lack of pure water and it’s availability. Below are six facts pulled from the report. 1. More than 9 billion people live in “potentially severely water-scarce areas,” according to the United Nations. That is more than 27 percent of all human beings alive right now. Factoid: “Water scarcity” is the lack of sufficient available water resources to meet the demands of water usage within a designated region. 2. More than 1 billion people have no access to safely managed drinking water. Not “some access.” Not “limited access.” They have no access. and is free from microbiological and priority chemical contamination. 3. 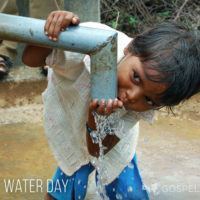 More than 263 million people must travel more than 30 minutes each way to collect and carry their daily water needs. Factoid: “Travel” usual means on foot. Factoid: 30 minutes is the minimum time used for the standard calculation. Many travel several hours each way. We are all familiar with the phrase coined by Samuel Taylor Coleridge in his “Rime of the Ancient Mariner:” “Water, water, everywhere, Nor any drop to drink.” That could describe the demand side of the global water crisis. 4. 5 percent of the surface water on the earth is the salt water contained in the oceans. 5. 7 percent of the remaining 3.5 percent of the total global water supply is fresh water that is locked away in glaciers, polar ice caps, and permanent snow. 6. Only 30.1 percent of the freshwater is usable, but not necessarily clean. This is the total surface water available for human use. Factoid: Only slightly more than 1 percent of all the water on earth is available for personal human use. We cannot afford to let our worldview exclude more than 27 percent of the world’s population lest we do what I mentioned at the outset: take life’s necessities such as safe drinking water for granted. Cool Cosmos, How much water does Earth have? This entry was posted in Essays and tagged clean water, global clean water crisis, Gospel for Asia, Samuel Taylor Coleridge, water crisis. Bookmark the permalink.